Self taped audition have become an integral part of today's online casting world. Seen by casting directors, directors, film producers and tv executives, self taped videos can buy you a ticket to the next round of auditions, or seal the deal and land you that dream role! For casting directors it enables us to take more chances with actors we don’t know or who we aren’t sure are capable of the role. It gives us a head start in showing different types and options to a director even if they are not in town. - says Manuel Puro. So, do your homework and read our 5 tips to make your Self Tape watchable. 1. Quiet Setting. Place your recording device horizontally, on a secure surface to avoid shaky footage. Use a plain background and make sure that there is no distracting noise getting in the way of recording the audio. Shoot from the waist up. 2. Natural light. If you're recording during the day, stand close to the window to get the natural light. In the evening avoid fluorescent or high contrasting lighting. 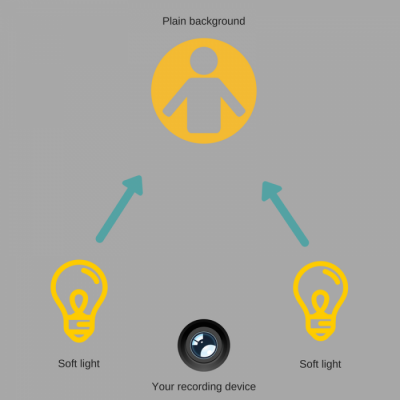 Take a look at the simple lighting pattern we've put together for you and test it before pressing that "START" button. 3. Clothing choices. Noting too flashy, just keep it simple. Wear a plain t-shirt with no logos or patterns; avoid white and black (white shirt reflects too much and black can create a distracting "floating head" look, especially if your background is dark). 4. Performance. Prepare and learn your lines. Be off-book! Keep your focus out of the camera and look away - don't record your audition addressing the viewer. Keep the fourth wall up! 5. Pick a good reader. Make sure it's someone with good diction and ask them to stand on either side of the camera - ask your agent, coach or a fellow actor for help. Your Reader should be able to act enough to help, but not too much to not take the attention away from you. Remember! Always shoot a quick test video to check all video and audio settings, and adjust if required.